Apparently, the axis Vienna–Beirut continuously holds a magic note to Palestinian-Austrian musician Marwan Abado. A philosopher friend from Beirut brought him together with pianist Paul Gulda, not foreseeing the consequential musical outcome this acquaintance would have. 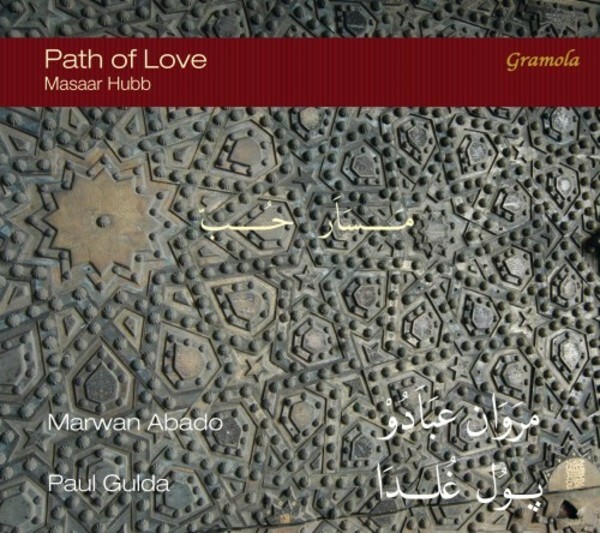 Following their encounter, the duo-program “Masaar Hubb – Path of Love” came to life and – based on it – the current CD release. “Masaar Hubb – Path of Love” introduces an exciting dramaturgy of oud and harpsichord, a rare and exceptional encounter in the world music scene. Bach suites, Andalusian scents, Arabic desert echos draw an open space for improvisation between two instruments of the orient and the occident, complemented by Abado's voice and oriental verses. The Austrian pianist Paul Gulda was born in Vienna in 1961 and had his first piano lessons from Roland Batik at the age of nine, later studying with his father, Friedrich Gulda, with Leonid Brumberg and finally, for three years, with Rudolf Serkin in the United States, where he participated in the Marlboro Festival. He began his concert career in a piano duo with Roland Batik, and a series of unusual recitals that included improvisation. Paul Gulda has since enjoyed a busy career as a soloist throughout Europe, in the United States, South America and Japan. He has released more than 20 recordings. Marwan Abado is the best known ambassador of oriental music in Austria and one of those musicians who demonstrate that Austria is a land of music full of inspiration and interesting encounters. The native Palestinian has lived in Vienna for over 20 years and has played with many musicians from various cultures and styles, including among others Timna Brauer, Alegre Correa, Krysztof Dobrek, Franz Hautzinger, Eliott Sharo, Kamila Jubran, Otto Lechner, Charbel Rouhana, Sahar Taha. On the one hand Abado's melodies and musical concepts take their power from the deep relatedness to his roots. He is conscious about the rich Arabic tradition which he is “musically living”, not only quoting. At the same time, Abado steps across the borders between orient and occident seeking dialogue with European traditions and musicians. The outcome, Abado's specific sound: cosmopolitan, borderless music.